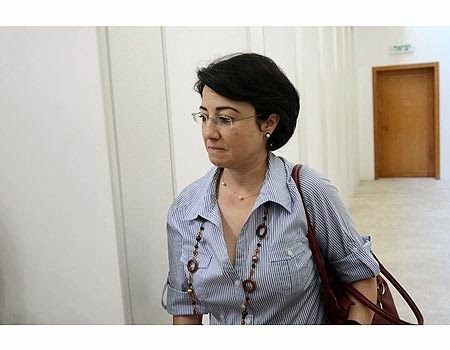 In the summer Haneen Zoabi, a member of the Knesset for Balad, was asked of the kidnapping and murder of 3 teenage settlers was an act of terrorism. She replied that it wasn’t. There was no reason to believe that it was part of a wider political or military campaign as opposed to the act of individual Palestinians. For this she has been suspended for 6 months from the Knesset, Israel’s Parliament. Ayelet Shaked MK of Jewish Home, a far-right member of the government coalition also wrote, on Face Book, that Palestinian mothers should be murdered in order to prevent the birth of Palestinian ‘snakes’. A clear call for genocide. Her punishment? There wasn’t any. The government has also passed an Act to raise the threshold that a Party needs to be elected, to 3.25%, the purpose of which is to prevent the election of Arab MKs. Israel used to parade itself as the ‘only democracy in the Middle East’. 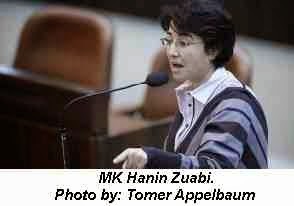 Now even that sounds hollow, as Zoabi, who supported and was on board the Mavi Marmara, has outraged the Zionist public in Israel. With the exception of the Meretz civil rights group, all the Zionist parties, including the Labour Party, voted to support, by 64-16 the motion to suspend Zoabi. Below is a full report from Jonathan Cook’s excellent blog. The three parties have between them eleven seats in the 120-member Knesset, with one held by a Jewish member of Knesset, Dov Khenin, for Hadash. In 2007 the party’s former chairman, Azmi Bishara, was accused of treason while travelling abroad and has been living in exile ever since. Among the anti-democratic measures passed in recent years are laws that penalize organizations commemorating the Naqba, the Palestinians’ dispossession of their homeland in 1948; that provide a statutory basis to admissions committees, whose function is to prevent Palestinian citizens living on most of Israel’s territory; and that make it impossible for most Palestinian citizens to bring a Palestinian spouse to live with them in Israel. Israeli legal scholars have noted the irregularities in the ethics committee’s decision to impose a record-long suspension on Zoabi. The committee’s task is to regulate parliament members’ behaviour inside the Knesset, not political speech outside it.